You should read this book: Why You Act The Way You Do. ~ CK Jacob: Nigerian Fiction And Lifestyle Blog. 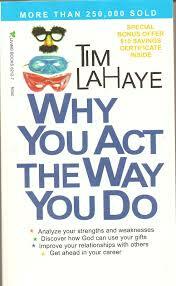 You should read this book: Why You Act The Way You Do. I am currently reading this book. The name of the author is Dr. Tim LaHaye. He explained the theory of temperament and how we can improve ourselves by identifying our own personality strengths and weaknesses. This book will help you improve your relationships with others, discover your unique potential in your job, your marriage, and your church. The Author is a popular speaker on family life and prophesy. He is an associate pastor. It's a good book. Get yours! Thanks for sharing the book review. I am impressed from the book and decided to geteBooks download online So I can read the novel. Hope I will get the book soon.